Mashonaland Central Provincial Affairs minister Advocate Martin Dinha (MD) claims he is a man of the spirit and that he knew long before it happened that Emmerson Mnangagwa would become president of Zimbabwe. 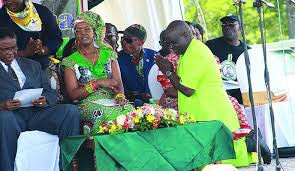 Dinha, who gained infamy for bootlicking former president Robert Mugabe and first lady Grace Mugabe, stirred controversy a few years ago after he reportedly facilitated a visit by then vice-president Mnangagwa to the famous Mt Darwin prophet, Madzibaba Wimbo who is credited for predicting Mugabe’s rise in power way back in the 1950s. Standard reporter Blessed Mhlanga (BM), last week spoke to Dinha about his fights with G40 members in Zanu PF and other issues and below are the excerpts. PF. What was your beef with him and the G40 cabal? MD: I am one of the people who wanted order restored in the province. The things that I was saying have come to pass. I was warning the system then. I was warning the president then that the little boys that were surrounding him, “the criminals surrounding you and surrounding the then First Lady” would destroy his image and legacy, which is what happened at the end of the day. Had it not been for our armed forces defending the Constitution through Operation Restore Legacy, we would have been in a worse situation. But I warned the nation. I was there in the Press. Everywhere I was talking and warning them and where are the boys (Kasukuwere, Jonathan Moyo and Patrick Zhuwao) now? They ran away. How can a young man like me, who only has read about the liberation struggle through history books, try and get hold of the reins of government? That is the height of stupidity. BM: You fought Kasukuwere in what appeared to be a losing battle. Did you feel safe and was anyone backing you? MD: I feared for my life. They went to my constituency and hunted for me threatening my life. Even now they have eyes on me, but I know it’s just cries of sour losers out there. But I am calling on them to come back home. Don’t say bad things from Kenya, South Africa, where you are hiding like mice. We have (Jonathan) Moyo talking bad things about the new government and everything that’s history, come back home, there is no better place than sweet home, we want them. BM: do you think you are going to win the forthcoming elections? MD: The next elections I am well-anchored. I am the MP for Mazowe North where I was delegated by the party to take that seat when the incumbent died. I am the minister of state. I support President Emmerson Dambudzo Mnangagwa. I support the vision of the government and where we are going, we are taking a paradigm shift — a break from the past. BM: You are part of that past, how do you manage to break from it? MD: We were opposed to what our government had become in the past. It had become redundant. After 36 years of ruling, instead of innovating new systems, the government had become lethargic, there was no movement. It was just business as usual. Now things have changed I feel I have a role to play both as a private citizen and as one of the leaders of the country. BM: There was a time when it appeared as if the “boys or criminals” as you have called them had won the war and Mnangagwa had been banished from the country. How did you feel then? MD: You know I am a man of the spirit. The Holy Spirit leads me and part of my faith had already told me that this is the man. He would be the ruler of the country and I made that pronouncement when we went to one of the church services. I made it repeatedly and I knew he would be. If you are a good leader, you pass through thorns. You are tried and tested like he did, but look at how he remained steadfast, patient and humble and not even a day did he contest anything against the then first lady and the then president. He remained humble, which we must learn from. BM: I remember you playing a leading role at a central committee meeting which was trained against Kasukuwere. You were pushing for his ouster but failed and tables were turned against you. DM: I kept pushing that people should have principles in life. If you see that certain people are being used by the devil to fight God’s plan, you also fight them using God’s plan. So one thing you must learn in life is being principled. Don’t be swayed by the heat of the moment. Those guys thought they were powerful, they thought they had it all. Remember they were now targeting me, they had a demonstration against me, they wanted me ejected from office. They were having their own way, but we knew it would be shortlived, because that was unacceptable, that was anathema to the people of Zimbabwe. Look now even the opposition is happy, we are going to have free and fair elections. The media is going to be opened up and there is hope for the people of Zimbabwe. BM: Hope for graduates who have no jobs, vendors who can’t sell their wares because people have no money? MD: My heart is aching for those people, the jobless pain my heart. I cry out to the educated who are roaming the streets of Zimbabwe, surely there must be hope for them, and there must be something for them. BM: What are the challenges you are facing in Mashonaland Central? MD: As a province we face a myriad of challenges because of the sanctions regime that we are under. We have challenges in terms of resource mobilisation, challenges in terms of infrastructure development. But I am happy that with the new government under the new dispensation of Cde Mnangagwa, we have started on a good note with a lot of hope for the people of Zimbabwe. As I speak now, the bridge that leads Ruyana River into Karanda that has been outstanding since 1961 is now under construction. It will now be shorter to come here through the Karanda bridge which we are commissioning within the 100-day plan. I am pleased to say we have wrestled the challenges against adversity. We have come with homegrown solutions as a province using the meagre resources that are there using our human capital and we want to be the shining province of Zimbabwe. We don’t talk too much, we act. BM: What action have you taken exactly? We act, as you travel from Harare to Bindura, travel to Harare-Bulawayo or any other road see how green our province is, the agricultural transformation. We are the best in terms of cereal production, the smallest province in the country yet we have beaten all other provinces in terms of maize production. We have an industrious time that works round the clock and I am pleased our president has acknowledged that. Early last week we had the president in Siyakulima in Guruve. You know what we achieved there, 50-hectare irrigation system, new in 21 days There was no internet connection there, we established it. At Karanda Hospital there is no connectivity yet it’s an integral institution, they need to do research and other works and soon I will be approaching ICT minister Supa Mandiwanzira to ensure that it is established, we have a nursing school here. There is action my brother here in the province.